If you've ever taken up a high-intensity workout, then you're probably familiar with the achy muscles that accompany them. Researchers have revealed some of the many benefits of L-citrulline — an uncommon amino acid found in watermelons, garlic, and onions — including preventing post-workout muscle pain, among other things. Studies have shown that L-citrulline has antioxidant properties that, when in supplement form, can remove lactic acid faster than at the normal rate, which means a faster recovery time, Encarna Aguayo, of the Technical University of Cartagena in Spain, said. Lactic acid builds up in muscles when intense exercise necessitates energy production faster than oxygen can be delivered. Normally, the body breaks down glucose into a substance called pyruvate, which is then metabolized aerobically, to be broken down for more energy. However, when there's a limited supply of oxygen, the body converts pyruvate into lactate, which can also power up the muscles, but with side effects, including increased acidity and next day soreness. Aguayo wanted to see if the L-citrulline in watermelon juice could act as a sports drink, and help speed her recovery time. But first, her team of researchers wanted to see what the optimal form of consumption would be. To do this, they looked at how colon cancer cells reacted when exposed to unpasteurized and pasteurized watermelon juice, as well as spiked water — all with the same levels of L-citrulline. They found that the cells absorbed 19 percent of the amino acid in watermelon juice after eight minutes, compared to only 13 percent of that in the pasteurized juice, and 12 percent of that in the water. Aguayo explained that although pasteurization can kill harmful bacteria, it can also "reduce the bioavailability of many bioactive compounds, reducing the food's functional properties." Now that she knew the unpasteurized juice was most likely to be absorbed by cells, she gave seven athletes a half-liter of watermelon juice or a fruit drink that had neither watermelon nor the amino acid. Some of the watermelon juice, however, had almost five times as much L-citrulline than the others. The participants then cycled for 11 minutes during which there were periods of high intensity pedaling and rest. Aguayo found that those who drank the watermelon juice, no matter which type, reported almost no aches in their legs the next day. The ones who drank the fruit drink, on the other hand, felt soreness. Citrulline is considered an essential amino acid. It has also been shown to benefit blood flow throughout the body and rid the liver of ammonia and other toxins. The citrulline content in watermelons has been shown to lower blood pressure and help with sexual dysfunction for males. Bananas – This fruit is full of easily digestible carbohydrates for your body's fuel supply, as well as plenty of potassium, which helps with nerve and muscle function. Since potassium doesn't linger in the body for too long, bananas are a good source of the nutrient right before exercise. Oats – Because they're rich in fiber, oats allow the body to gradually release carbohydrates into the bloodstream, keeping your available energy consistent over time, instead of burning through it all at once. Wholegrain bread – Whole grains are a good source of carbohydrates. Topping it with jam or honey can also provide more sugar for fuel, or a sliced boiled egg can add protein. Fruit Smoothies – They're high in carbohydrates and protein, and because they're drinkable, they digested even faster than solids. Source: Tarazona-Diaz M, Alacid F, Aguayo E, et al. 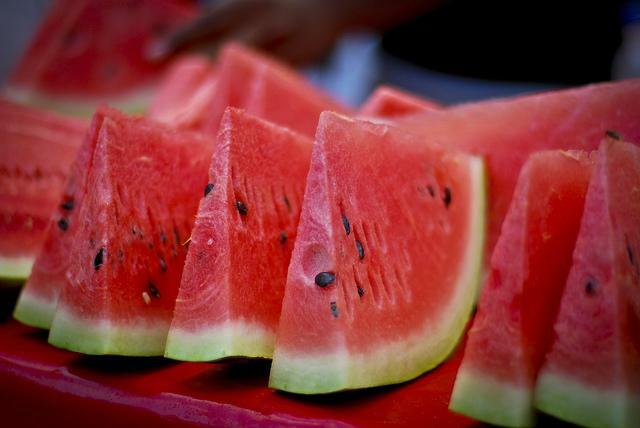 Watermelon Juice: A Potential Functional Drink for Sore Muscle Relief in Athletes. Journal of Agricultural and Food Chemistry. 2013.